This coconut cream poke cake is so moist, and it’s topped with coconut cream whipped cream frosting and sweetened coconut. A Coconut Lover’s DREAM come true! This Coconut Cream Poke Cake is EPIC. 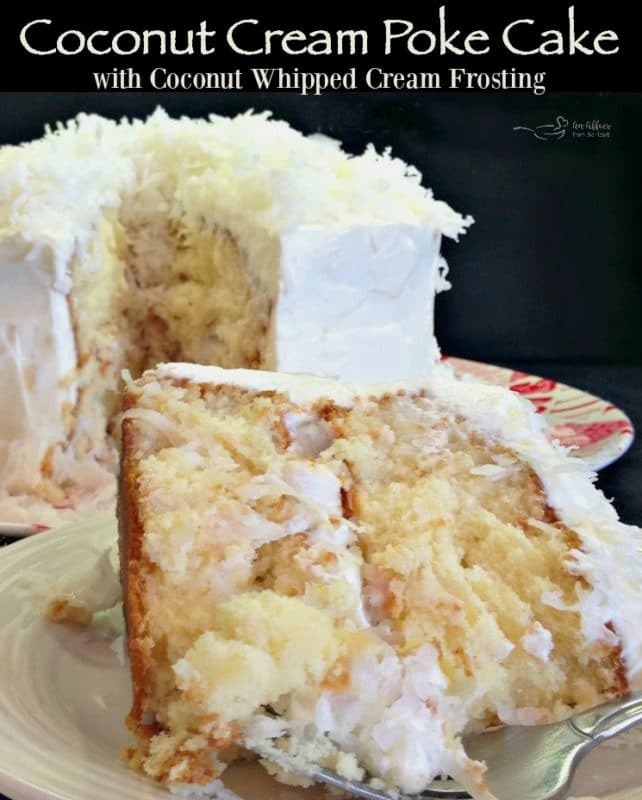 If you don’t fall in love with the cake, the Coconut Whipped Cream Frosting is sure to hook you. Now, I am here to tell you, that there aren’t many things I don’t eat. I’m really not picky at all. But coconut has never been a favorite of mine. I love it in Pina Coladas … and suntan lotion … even more when these two things are put together, but to eat? Not so much. Now, my husband on the other hand? He LOVES coconut, and I make him this Chocolate Macaroon Cake every year for his birthday. That cake you see up there? 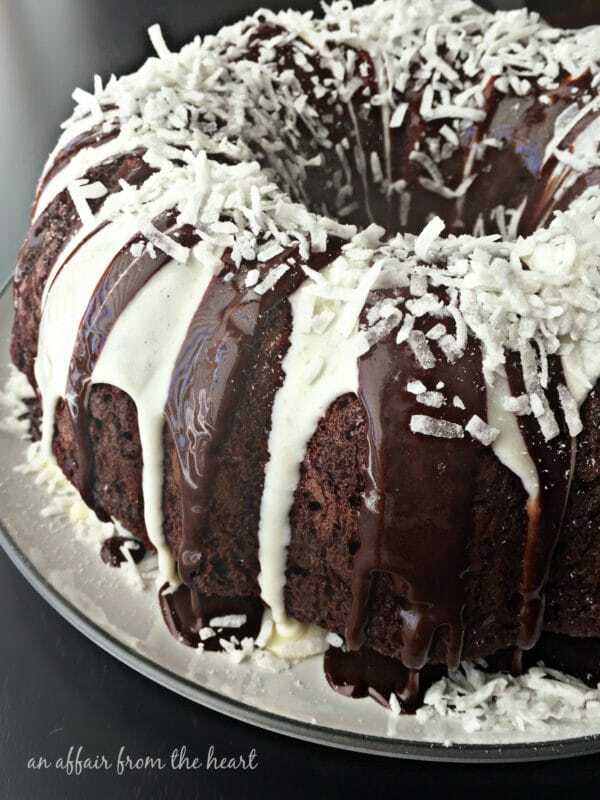 It has a tunnel of coconut throughout the inside. I usually just eat around the coconut, and give that part to him, which is just one more thing he can love about me in the end, right? I was asked to bring dessert for the Super Bowl party my brother and sister in law were hosting, and just like my husband, his whole family LOVES coconut. I have seen various coconut cake recipes I wanted to try, but honestly, couldn’t settle on one. So I started picking components from each one I liked and this was the finished product! I will just tell you, that this is BY FAR the BEST frosting I have ever eaten. I switched up my whipped cream frosting just a smidgen and it was PERFECTION with this cake! 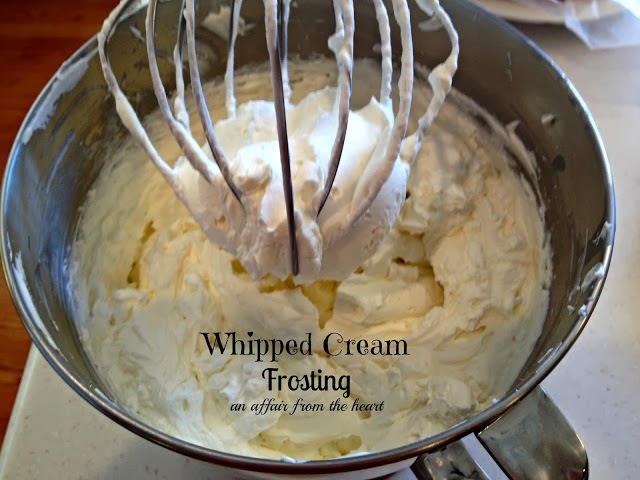 Here is my basic Whipped Cream Frosting Recipe. It’s delicious on anything! My first choice? A spoon! While cakes are warm poke holes all over with a large fork or skewer. Pour cream mixture over the top of the cakes. 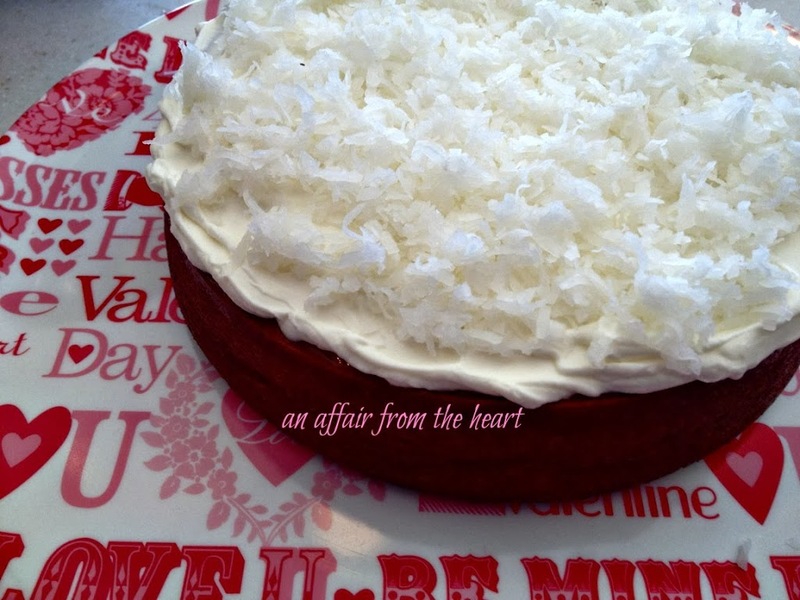 Top bottom layer with frosting and coconut before adding top layer. This cake takes a bit of time to make, as it has quite a few steps. Just know that when you take that first bite? It’ll ALL be worth it! Nobody will ever believe that this cake starts with a box cake mix. Why is everyone so against them anyway?? I have recipes for cakes from scratch on my site, but I have nothing against a cake that starts with a box mix. Not ever. This Coconut Pudding Poke Cake that I make, is one of my most popular recipes. Guess what? Box mix. Same with that Chocolate Macaroon Tunnel Cake I talked about earlier, and this Pineapple Coconut Tunnel Cake that tastes like a Piña Colada? Box mix. How can I hate on the box mix when so many good things come from it? But it’s time to give you what you came here for. 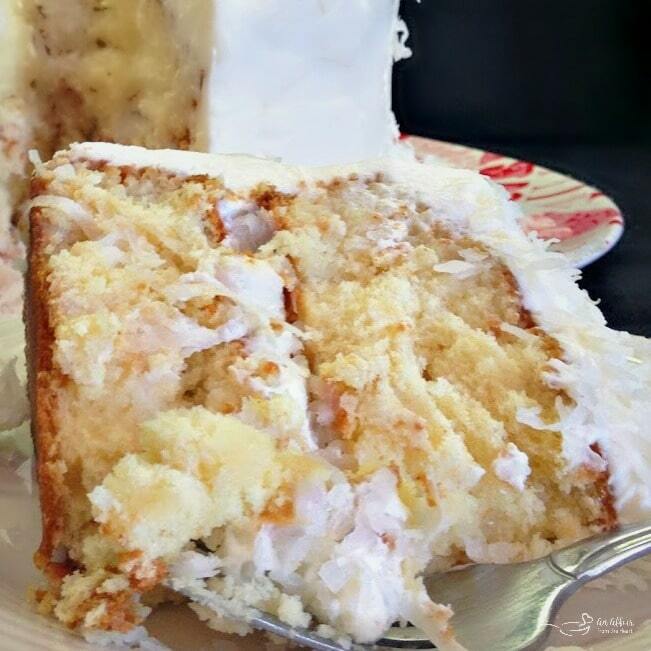 Let’s make this Coconut Cream Poke Cake with Coconut Whipped Cream Frosting. Shall we? Preheat oven to 350 degrees and grease and flour 2 - 9" cake pans. In your mixer, combine all of the ingredients for the cake for about 30 seconds, then beat for 2 minutes. 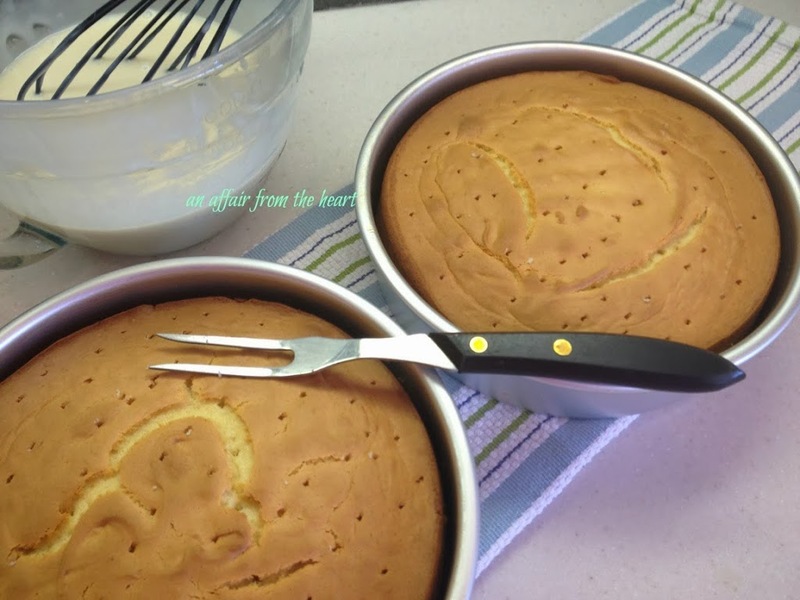 Distribute evenly in each cake pan and bake for 30 minutes or until cake tester comes out clean. Combine ingredients for cream and set aside. Place in the refrigerator for about 5 hours, or over night is even better. To make the frosting, cream together cream cheese, sugar and extracts until smooth. Then, with the whisk attachment, slowly add the whipping cream and and whip until stiff peaks form. To remove the cakes from their pans: This is a little tricky. I took a thin knife and ran it around the edge, and I sat the bottom of the pan in hot water for a minute or two, to loosen it up. I flipped it out onto a piece of waxed paper, then flipped it again onto my plate. Top with bottom layer with a little frosting, and about 1/2 cup of coconut. Place second layer on top, frost and top with remaining coconut. 1. This cake would be super easy to make as a 9x13, so if you're not looking for the presentation of the layers, I would recommend it! If you are making in a 9x13 you wouldn't have to worry about removing the layers from the pans after the cream mixture is added, just frost and top with coconut, and you're done!! 2. I got to thinking that every cake mix isn't the same, so rule of thumb: Replace water with milk, add pudding of choice, add extract and leave the eggs and oil as per instructions on the box of cake mix! you purchased. 3. Start with about 3/4 of the cream mixture. If the cakes are too wet, it makes them hard to move and stack. Nutrition accuracy isn't always guaranteed. Yum- I am making this! My husband and son are big fans of coconut! This all coconut cake would be just the right thing for them! G’day! 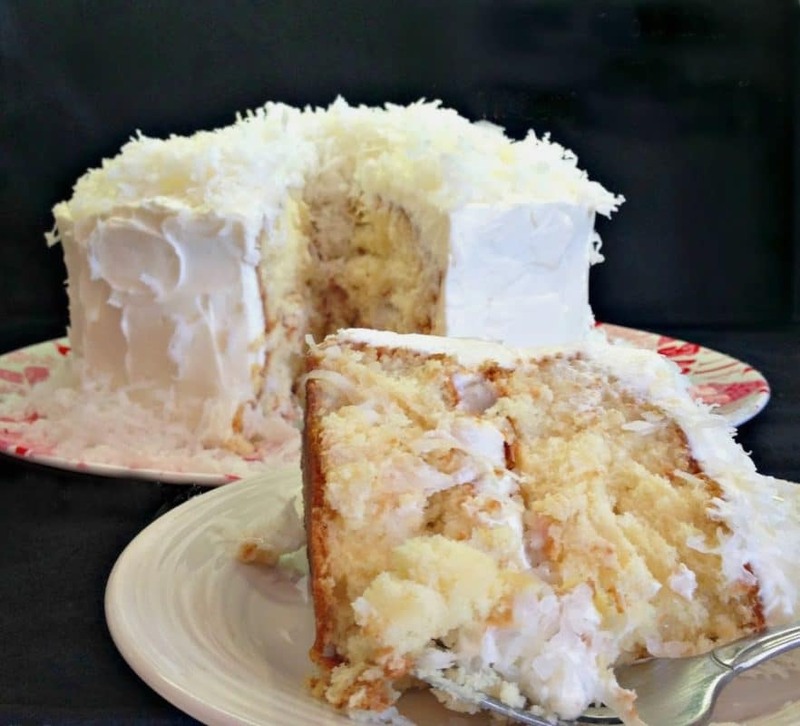 BIG fan of coconut and great cake! My poke cakes never turn out this pretty 🙂 I am so jealous of your baking skills! This coconut cream poke cake with coconut whipped cream frosting looks SO GOOD! By coconut cream do you mean the sweetened kind? Or unsweetened? 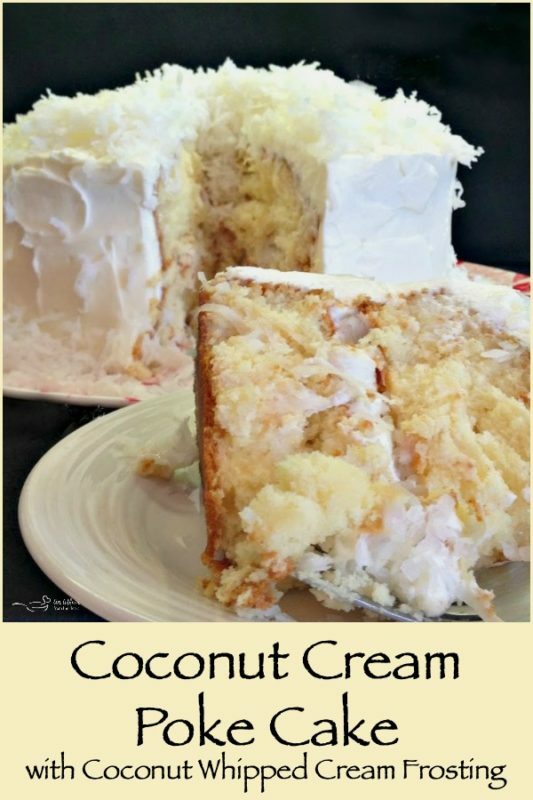 Grampy and I love coconut and your cake looks and sounds just perfectly delicious. I’ve never make a poke cake but in this instance I can see how it would be just the thing to do. Thanks for sharing, I’ve pinned/shared. Fantastic Blog post! Thank you so much for sharing it at our Grand Opening of #PureBlogLove Link Party! Have a great night and see you next week at 8pm EST! I wanted to make a coconut cream cake for my step dad’s birthday but had never made one before. Came across your recipe and I knew this was the one to try! It’s all done, in the fridge waiting to be eaten tomorrow. Thanks for posting this! So happy you found a recipe here that you enjoy!! Thank you for the positive feedback! Help! 🙂 trying to make this for my dad’s birthday! My icing seems to be too thin…never got the “stiff peaks”. Any way to correct this? I found your recipe and printed a few weeks ago in order to make for my husband’s birthday over memorial weekend. He loves coconut cake. I had tried another recipe before and it flopped. So I was a bit intimated but I thought, I’m usually pretty good at cakes and frostings so I would give it a try. All I can say is the frosting is amazing and I usually prefer very heavy cream cheese or butter cream frosting. I did pull your ordinal recipe for just your whipped cream frosting. It gave more detail and tips than the one that was with the coconut poke cake recipe (I just substituted the extracts for the coconut poke cake frosting – added a little more coconut extract). I took the extra steps to make sure everything was cold. I used a metal bowel for mixing *After I mixed the cream cheese, sugar and extracts, I put the back into the refrigerator to chill since my cream cheese mixture was pretty warm to ensure that I got the lumps out. I also put my beater into the freezer for a while to get it really cold. After about thirty min., I added the whipping cream very slowly. It was perfect and easy to frost the cake. Wonderful cake and frosting. I also used your warm water trick to remove the cakes but I also put them back into the refrig for a while while I was making the frosting. I think the trick is making everything cold. I also only used about the half of the coconut creme mixture to pour over the pokes. Love this recipe. I look forward to seeing more. Thank you so much for sharing with me! I am so happy that you have found a new recipe to love! I especially loved that you shared your tricks with me. My mom always told me to keep everything cold when making homemade whipped cream, that it always turns out better. I like to listen to my mom! 😉 I hope you visit often, Lori! We ate it last night for my husbands birthday. Best cake that I have ever made. 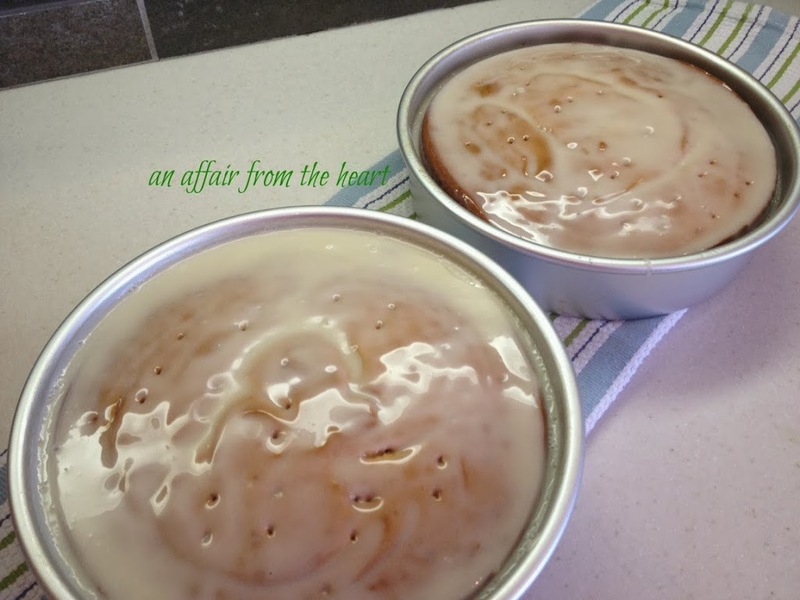 I have a good Italian creme cake recipe that is good but your recipe is so much better. I look forward to trying some your other recipes. Do you think you could use as a 13×9 dish cake? I have a nearly identical recipe that uses a 9×13 pan and it works great. I know what coconut milk is and use it a lot but what is coconut cream?where can I buy it. That coconut cake is one of my favorite cakes. I would love to have the recipe.Thank you. It’s actually granulated. Different I know! Are you supposed to use 1 1/4 cup of milk in addition to the milk on the cake box?? Or just 1 1/4 total? That is for the cake mix. Not in addition to.